Jay Santos is the first celebrity chef to be featured by the California-based mobile banking startup, which hawks customized cards for brands from Care Bears to “Star Trek” characters. Four years after making it to the finale of TV’s “Hell’s Kitchen” as a contestant, celebrity chef Jason “Jay” Santos is finding creative new ways to keep his face in front of the public. 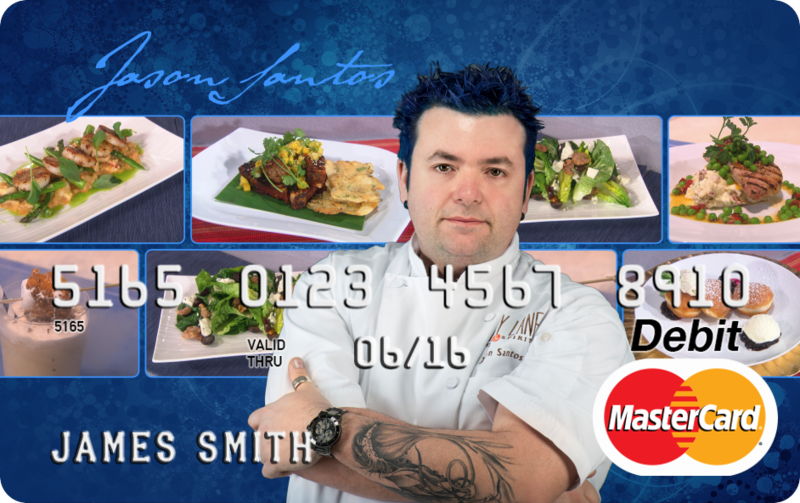 The blue-haired owner of Abby Lane Boston and Back Bay Harry’s has struck a licensing deal with Card.com to put his image on a prepaid MasterCard debit card. He’s the first celebrity chef to be featured by the California-based mobile banking startup, which hawks customized cards for brands from Care Bears to “Star Trek” characters. With his regular cooking segments on morning talk shows, successful restaurants, and occasional reappearances on “Hell’s Kitchen,” Santos has built a strong online following. Card.Com is betting his fans and other culinary-minded customers will snap up Santos cards. Santos said the deal was a no-brainer. A Glendale, Calif., licensing agency, C3 Entertainment Inc., scored the Card.com deal for Santos, who declined to detail its terms. Other cards sold on the site feature popular television shows, stock-art photos representing hobbies and sports, and cartoon characters such as Popeye and Garfield. Card.com is set to issue a Santos credit card in February. Customers who pay with either card at his restaurants will probably get a free appetizer or dessert, Santos said. Santos, who earned TV fame for his blue mane and relentlessly outgoing and upbeat demeanor, admitted it’s strange seeing his face on a card. Still, he’s having fun hyping it to employees and family members.